Received: 14 February 2016 / Revised: 28 February 2016 / Accepted: 1 March 2016 / Published: 6 March 2016. Department of physics, College of Sciences, Wasit University, Kut, Iraq. A theoretical study of resonant tunneling and current density of electrons through Ga As/AlX Ga1-X As triple-barriers system is presented within the energy range of electrons ε< the potential barrier height (Vb). By use of the propagation matrix method, the transmission coefficient of the structure is determined as a function of the incident longitudinal electrons energy for different values of applied voltage (Vs). Effect of well width and mole fraction (x) of barrier are independently studied on quasibound state energy with (ε < Vb), and also for resonant tunneling current density for quasibound state. The solutions obtained are exact and can be found easily by using MathCad program. Based on these calculations, a new class of resonant tunneling superlattice devices can be designed. Keywords: Ga As/AlX Ga1-X As superlattice, transmission coefficient, resonance tunneling. The single most useful quantum-confined structure in optoelectronics is arguably the quantum well, which is a sandwich formed by thin layer of narrower-band gap semiconductor trapped by two-wider band gap semiconductor layers. The periodic structure containing a series of wells and barriers called “superlattice” (SL). Fabrication of such structures was made by the molecular beam epitaxy (MBE) and metal organic chemical vapor deposition (MOCVD) techniques . The coupling between wells in the (SL) causes the splitting in energy levels gives rise to continuous bands known as (mini-band) which are separated by small forbidden gaps . When the special dimension is reduced to a scale that it is comparable with the de Broglie wavelength of electrons, the wave nature of electrons is expected to play in a very important role in tunneling properties . When electron incident on (SL) with effective mass (m*) and kinetic energy (ε) is close to the eigen energy of the quantum well, this electron suffer resonant tunneling and the transmission coefficient T(ε) is equal to one, i.e the double barrier is totally transparent for particle transmission [2,4]. The propagation matrix method (PMM) may be considered as one of the most accurate by eminent researchers with this technique and the transmission coefficient can be computed for double quantum-well triple-barrier heterostructure devices -. In this work, we report theoretical investigation on the transmission coefficient and resonant tunneling current density through Ga As/AlX Ga1-X As triple-barriers system under bias voltage. Examining the dependence of transmission probability and the resonance tunneling current density on a mole fraction (x), and the dimensions of well width in the structure have been considered. Fig. 1 Band diagram of active region. where x is the growing axis, εx is the incoming electron energy, Ψ(x) is the wave function in the growing direction and m* is the effective mass of each monolayer with potential energyV(x). Fig.2 the potential energy profile of conduction band under applied bias. where εF is the Fermi energy (εF = 0.005eV), T is the temperature (300K), εl is the electron kinetic energy perpendicular to the device layers (in x-direction), kB is the Boltzmann constant, and ma* is the electron effective mass in GaAs. The tunneling electrons do not see any potential change in the transverse directions and their transverse momentum conserved. The electron longitudinal momentum (kx) generally changes with distance . 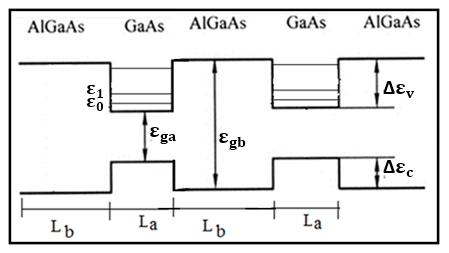 The barrier height at the conduction band edge is obtained from Dingle’s rule assumed to be (88%) of difference between the band gaps of two materials GaAs, and AlX Ga1-X As [9,12]: Vb= 0.88(εgb – εga ). εgb (x) = 1.424 + 1.247x (for x < 0.45). (x) = 5.6533 + 0.0078x. The effective mass of the well material (GaAs) is ma*= 0.065m0, while the effective mass of barrier material ( AlX Ga1-X As) is obtained from the formula: mb* = 0.067 + 0.083x m0 (for x < 0.45). To study the transmission coefficient given by the resonant tunneling diode, we have applied a bias voltage (Vs) in the top of the emitter region. Figs. (3a-c) show the variation of Log (transmission coefficient) as a function of incident longitudinal energy of electrons for three barriers system (N=3), as a mole fraction (x = 0.3) and the dimensions of the wells equal to barriers (La = Lb = 2.6nm), and this for different applied bias voltage (Vs = -0.27,0 and 0.31)V. The tunneling probability exhibit peaks when the energy of the incoming electrons coincides with one of the quantized levels inside the well, these electrons suffer resonant tunneling i.e. 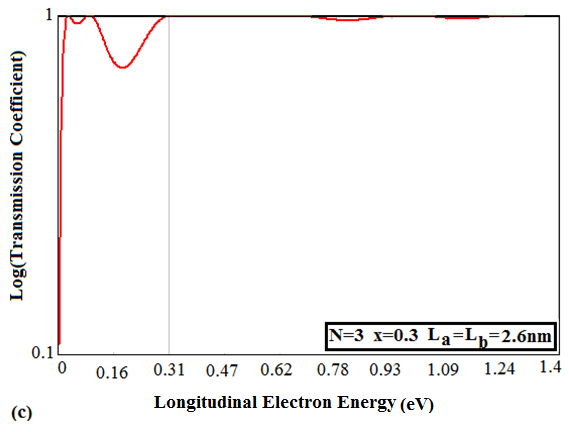 electrons tunnel out without any significant attenuation in their intensity; these energies are referred to resonant energies for (ε < Vb ), the first peak from fig. (3) is referred to the ground state level (εo), while the second peak is referred to the first excited state (ε1). When the applied bias voltage is increased, the transmission probability slowly deceases down to small electron energy values, i.e. all the resonant peaks of transmission probability become hidden, mainly due to the slope of the barrier potential .This behavior has also been reported in similar structures by C. E.Simion et al  and R. Djelti et al . Fig. 3 Log (Transmission coefficient) versus longitudinal electron energy for GaAs/ AlX Ga1-X As at (a) Vs= -0.27V, (b) Vs = 0V, (c) Vs = 0.31V. Figs. (4a, b) shows the relationship between the ground state levels (ε0) in the quantum well as a function of the bias voltage (Vs) for (GaAs/AlX Ga1-X As) triple-barrier structure. It is so clear, from these figures that the ground state level decreases as we increase the bias voltage, this is due to the confinement of the states in the miniband which become increasingly important [16, 17]. Also, it is clear from figure (4a) that high mole fraction of (Al) in the system, give a higher level value since we are dealing with low energy gap. While figure (4b) shows the increasing of the well dimension, resonant tunneling phenomenon is evident at lower energy values [8, 14], that is because from the law of the energy levels in the quantum well, energy levels inversely proportional to the square of the well width and this law explain this behavior of the levels shifting when reduced or increased in well width and move higher or lower energy values, respectively. Fig 4. Dependence of ground state level on bias voltage for GaAs/AlX Ga1-X As. The current density (at room temperature , εF = 0.005eV) is derived by integrated the transmission coefficient T(εl, Vs ) over all relevant states in the basis of eq. (17). Figure (5) depicts the resonant tunneling current density for ground state level (J0) as a function of bias voltage (Vs) for (GaAs/AlX Ga1-X As) superlattice structure. The net tunneling current, at zero applied voltage, is zero, because the Fermi-level is constant across the junction and no filled states exist (electrons) on either side of the junction, while below the Fermi-level there are no empty states available on either side of the junction. Physically, when a bias voltage applied to the structure a small current flow such that the resonant energies (εo state) approach the Fermi energy of the electrons at the left of the barrier. The current density increases strongly as voltage increase, when the energy of the incident electron coincides with the energy of one of confined states. Further increase of the bias voltage (Vs > potential barrier height Vb)detunes all the resonant peaks of transmission probability become hidden that is result no resonant tunneling current density, this result also has been reported by A. Zarifkar et al . From in figure (5a) noticed that when increasing the mole fraction of (Al) content, the resonant tunneling current density for ground state level (J0) will decrease. This behavior comes in agreement with the results in experiment by others S. Mukherjee et al , M. Tsuchiya et al  and H.Sakaki et al . The explanation of this behavior is expected when increasing the mole fraction of (Al), (x = 0.2,0.3 and 0.4), it which will cause an increase in the barrier height, (Vb = 0.21,0.32 and 0.43) eV, respectively. That is due to poor tunneling through barriers, because the necessary conditions for tunneling occur when potential barrier height is low and the transmission coefficient will be decrease so (J0) will decrease, as in eq. (17). While fig. (5b), presented that when increasing of well width, the resonant tunneling current density for ground state level (J0) will increase, this that make agreement with author R. Djelti et al . It should be pointed out that the band gap between miniband become decrease due to continuous energy state and the quantum confinement effect will be decrease. The electron mobility increases and drift velocity will be increase (J = nevd). Fig 5. The (J0 – VS) curve for GaAs/ AlX Ga1-X As (a) at x=0.2,0.3 and 0.4(b) at well width (3.5,4 and 4.5)nm and constant barrier width=2.6nm. 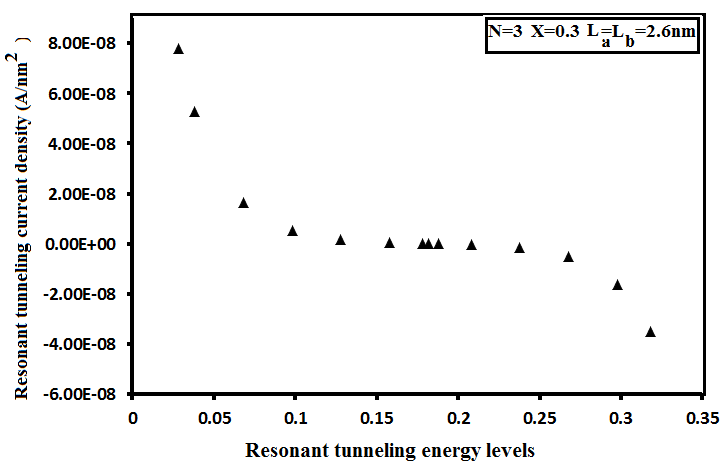 From these results, we can put relationship between resonant tunneling current density and the energy levels in the structure, as shown in fig. (6), at high energy levels, the resonant tunneling current density will be decrease that is related with quantum confinement effect. Fig. (6): Dependence the resonant tunneling current density on energy levels. We have numerically determined the effect of each of bias voltage, mole fraction of (Al) and well dimension on the transmission coefficient, resonant tunneling energy and the resonant tunneling current density for ground state level of GaAs/ AlX Ga1-X As triple- barrier structures. We can conclude that by propagation matrix method which is simple and accurate method to determine transmission probability as result to find current density (for ε < high of barrierVb). Under high voltage bias it will in generally be much harder to obtain resonant tunneling, mainly due to low energy level and high current density. In addition, high value of mole fraction gives high energy level for ground state level but low current density because of potential high barrier increasing. While high well width one will find low energy level but high resonant tunneling current density. We are grateful to Dr. Moafac C. Abdulrida (Nanoscience Laser and Devices Group) for his fruitful discussion. J.D.Cressler, “Silicon Heterostructure Devices” CRC press, Taylor and Francis group, (2008). S.M.Sze and K.K.Ng, “Physics of Semiconductor Devices”, 3rd edition, John Wiley & Sons., Inc. (2007). X.W.Liu and A.P.Stamp, “Resonant Tunneling and Resonance Splitting: The Inherent Properties of Superlattices”, Physical Review B50, no.3, (1994). S.P.Bhattacharya and S.Sinha, “Non-Relativistic Formalism of Resonant Tunneling in The Semiconductor Superlattices”, Journal of Physical Science, Vol.12, (2008). A.F.J.Levi, “Applied Quantum Mechanics”, University of Southern California, A.Levie, P.111-125, (2003). 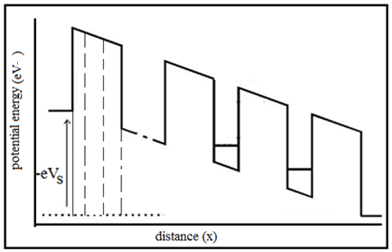 A.Zarifkar, A.M.Bagherabadi, “Numerical Analysis of Triple-Barrier GaAs/AlxGa1-xAs Resonant Tunneling Structure using PMM Approach”, IJCSNS International Journal of Computer Science and Network Security, Vol.8, No.6, P.266-270, (2008). C. E.Simion, C. I. Ciucu, “Triple -Barrier Resonant Tunneling: a Transfer Matrix Approach”, Romanian Reports in Physics, Vol. 59, No. 3, P. 805-817, 2007). R. Karmakar et al, ” Calculating Transmission Coefficient of Double Quantum Well Triple Barrier Structure having Parabolic Geometry using Propagation Matrix Method”, International Journal of Engineering and Advanced Technology (IJEAT) ISSN: 2249 – 8958, Volume-1, Issue-2, December (2011). (e-mail:[email protected]). J.Nanda et al, “Transmission Coefficient, Resonant Tunneling Lifetime and Traversal time in Multibarrier Semiconductor Heterostructure”, Physika B, 383, P.232-242, (2006). R.Tsu and L.Esaki, “Tunneling in a Finite Superlattice”, Appl. Phys. Lett. Vol.22, No.11, P.562-564, (1973). J.P.Sun and G.I.Haddad, “Resonant Tunneling Diodes: Models and Properties”, Proceedings of the IEEE, Vol.86, No.9, P.641-661, (1998). M. Tsuchiya and H. Sakaki, “Dependence of Resonant Tunneling Current on Al mole fractions in Alx Ga1-x As GaAsAlx Ga1-x As Double Barrier Structures”, Appl. Phys. Lett. 50, 1503, (1987). S. A. Almansour, D. Hassen, “Theoretical Study of Electronic Transmission in Resonant Tunneling DiodesBased on GaAs/AlGaAs Double Barriers under Bias Voltage”, Optics and Photonics Journal, 4, 39-45, (2014). (e-mail:h [email protected]). R. Djelti et al, “Resonant Tunneling in GaAs/AlxGa1-xAs Superlattices with a Periodic Potential Profiles”, Superlattices and Microstructures 50, p. 659-666, (2011). (E-mail address: (R. Djelti). Z. Aziz et al, “Suppression of The Singularly Localized States in Dimer Quasiperiodic Fibonacci Superlattices”, Solid State Communications 150, P. 865-869, (2010). S. Mukherjee et al, “Theoretical Computation of Transmission Coefficient of Double Quantum W ell Triple Barrier Structure in Presence of Electric Field”, International Journal of Soft Computing and Engineering (IJSCE) ISSN: 2231-2307, Volume-1, Issue-NCRAMT2011, July (2011). M. Tsuchiya, H. Sakaki, “Dependence of Resonant Tunneling Current on Well Widths in ALAs/GaAs/ AlAs Double Barrier diode Structures”, Appl. Phys. Lett. 49, 88, (1986). H.Sakaki et al, “Resonant Tunneling in Quantum Heterostructure: Electron Transport, Dynamics, and Device Applications”, IEEE Journal of Quantum Electronics. Vol. 25. No. 12, (1989). Advanced Research Journal, peer-reviewed multi-disciplinary journal.